I got a little bored and i can't sleep at the moment. So i scanned one of my designs and did some stuff to it from adobe photoshop cs4. I mixed, played around with the program and until i came up with this look. I really like the black and white color of it and added some exclusion effect and I put bunch of my repeated name all around it. This looks like a domino piece with a girl engrave to it. 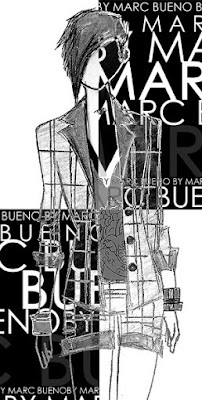 The drawing was one of my designs for my fall 2009 collection that i am currently working at the moment. I can't wait to finish it all and show it to you guys. Oooh that looks like it's gonna be really great can't wait to see the finished product.